If your inspiration often comes by through an image or a photo, then Pinterest is totally for you. Never heard of Pinterest? Not too late yet. Then I found Pinterest. Was quite reluctant at first to add one more 'social media thingy' to my life but I thought I could give it a try since a lot of people are using and creating an account is as easy as linking to your Facebook or Twitter or Email. As you can see below, my boards are named after the Malay and Hokkien languages, easy to guess on the meaning based on what I pinned. 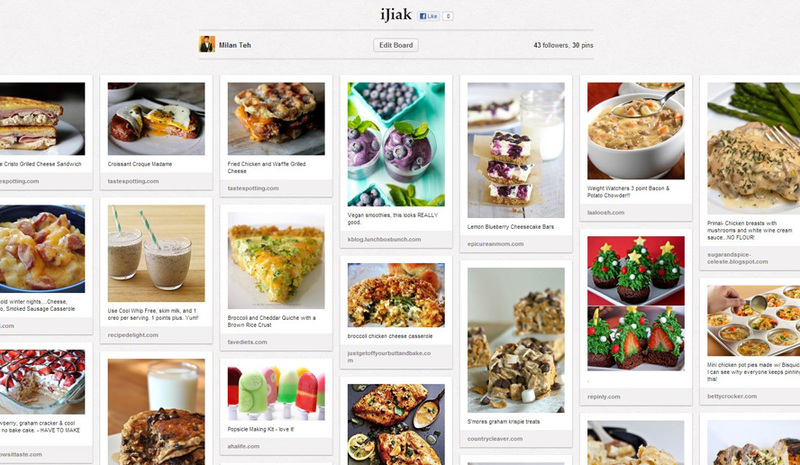 There are more than 10Millions of Pinterest users worldwide and 80% of them are females. If you are a girl, it's certainly a wonderful news. Meaning there will be lots of colorful pictures that will interest or inspire you. Curious why sometimes when telling your husband a particular color is Turquoise(which is in the blue color family) but they argued it's green? It's a fact that 1 out of 12 men have color deficiency issues on the other hand it's 1 out of 255 for females. In other words, girls are more sensitive to subtle changes of color. There are lots of things to explore to literally, everyone. Furthermore, a bride who's looking for ideas to make her beach or garden wedding unique, where likely the idea would came from? 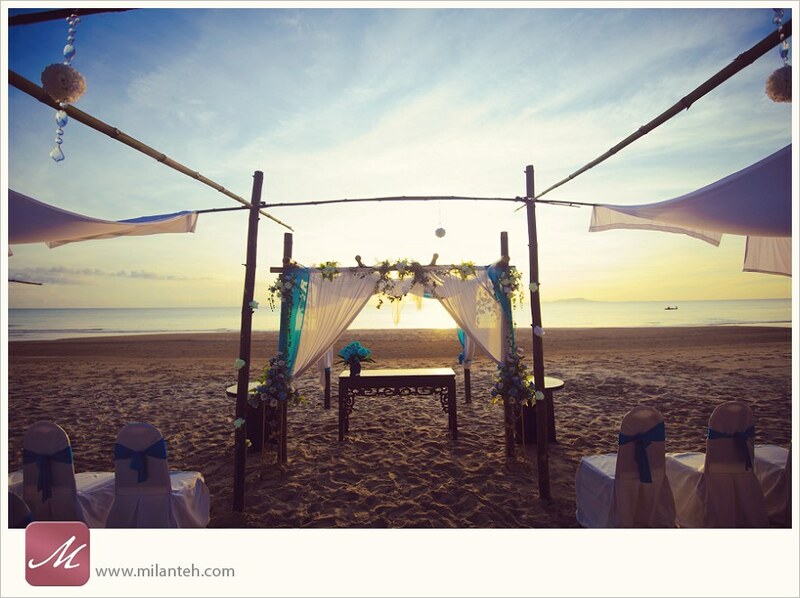 Yes, couple who've done beautiful beach or garden wedding around the world and often, a lot of these pictures are posted in a blog by the couple, wedding photographer, decorator or florist. eat as much nice food I've never tried after mentally-demanding-work. So... despite being a late adopter, I still find Pinterest as an inspiring place which has far lesser noise than Facebook since I'm only following people whom I think I like their aesthetic sense or thoughts. They have rolled out secret boards lately, every user gets 3 of them, how would these be helpful? Maybe you wanna plan a surprise vacation? Secret party for your spouse? Special present idea/food recipe for your loved ones? Secret Boards are private to you. Down the road, how the social media and buying trend will change in Malaysia would really be dependent on whether Pinterest is widely used like Facebook or not. Anyhow, hope you'll find these information useful to decide whether Pinterest is for you. &.b.t.w. - If you like the hover and pin feature in my blog and wanted to add one for your self-hosted wordpress blog too, install the Pinterest Pin It Button For Images plugin by Canha to your blog. You might want to consider adding another typical Pin It button at the bottom too. People with mobile cannot 'hover', even using mobile Chrome browser showing desktop site, I personally find it awkward. &.&.b.t.w. - I think 2012 is passing very quickly, what about yours? Someone suggested that it's because of our daily repetition routine that makes us thought so, it's interesting of how he puts it.